Dry to moist. Wood edges, prairies, fences, beneath utility wires. Full shade to partial sun. 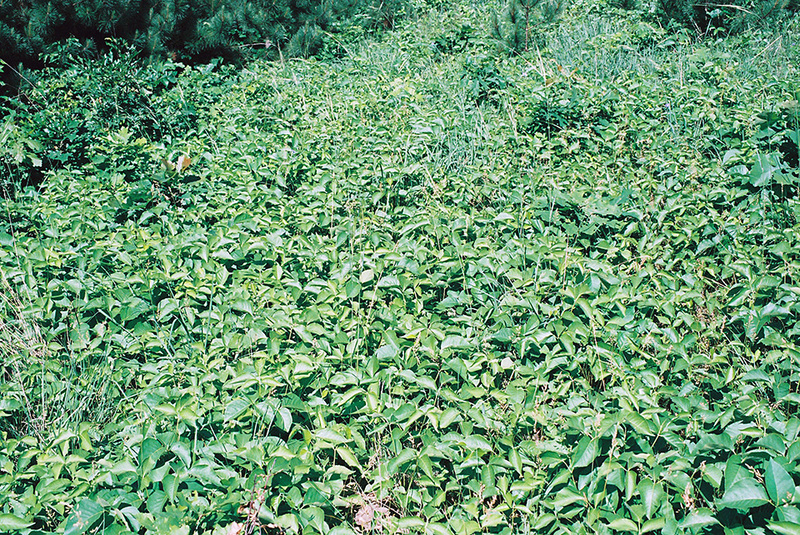 This is an erect, perennial shrub that rises on a single stem from a usually underground rhizome. It often forms colonies. 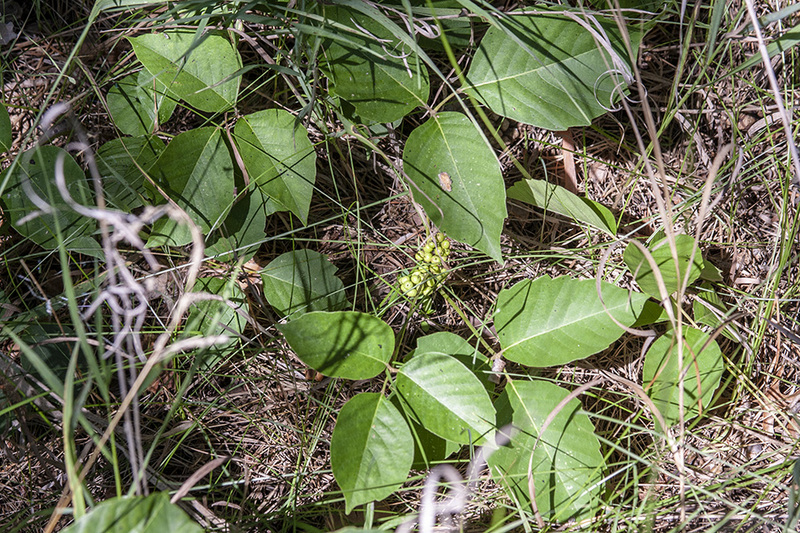 The plant is usually a ground cover, sometimes a shrub, rarely a vine. If it is a vine it climbs weakly, and will not climb trees. Stems are woody, erect, usually unbranched, and lack aerial roots. 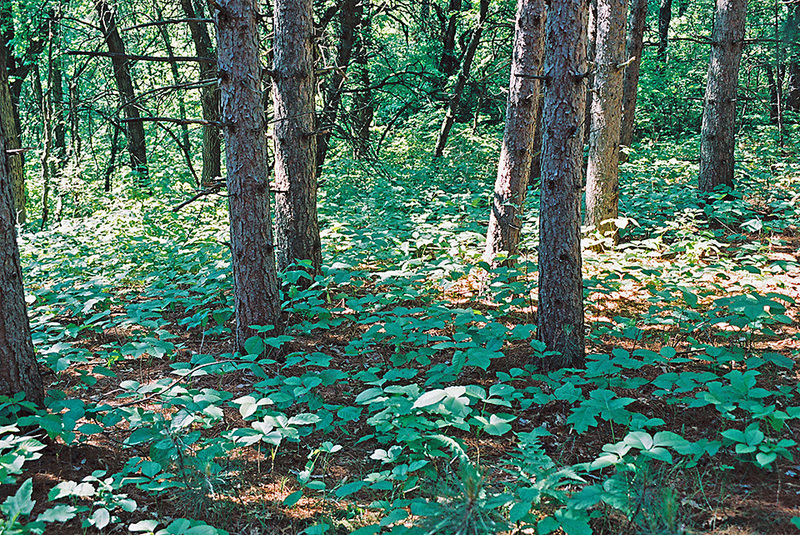 Leaves are alternate and are borne near the end of the stem usually on leaf stalks. The leaf stalks are hairless and ½″ to 10″ long. 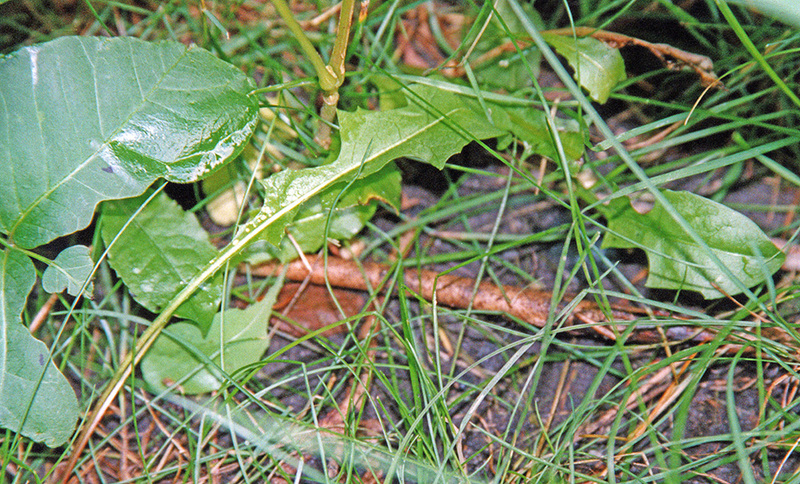 The base of the leaf stem is enlarged and grooved. When the leaf is absent, a u-shaped or v-shaped scar remains. 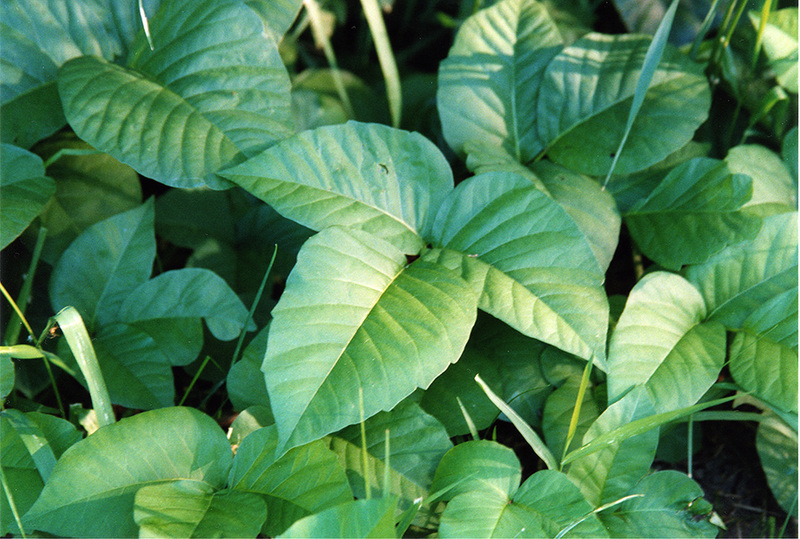 The leaves are divided into 3 leaflets. 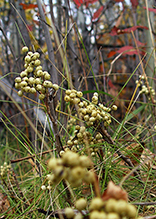 The leaflets may be egg-shaped, with the broad portion at the base where it attaches to the leaf stalk, or diamond shaped, broadest in the middle and tapering toward both ends. They taper to a point at the tip. They are 1″ to 6″ long. The two side leaflets are usually shorter than the central leaflet. The leaflet margins may have shallow lobes, they may have rounded teeth, or they may be entire. They tend to be folded slightly along the midrib, not flat. The upper surface is usually entirely hairless, or there may be a line of curly hairs on the midvein. The lower surface is either entirely hairless or has appressed hairs. 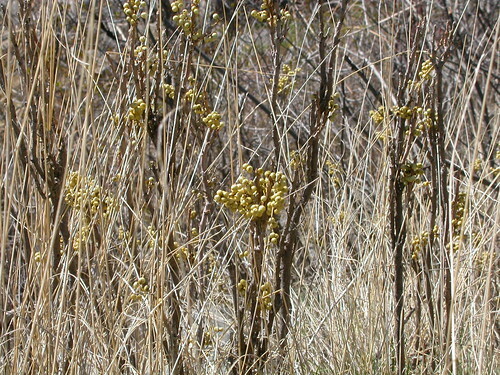 In the spring the leaves are glossy and have a reddish tint. 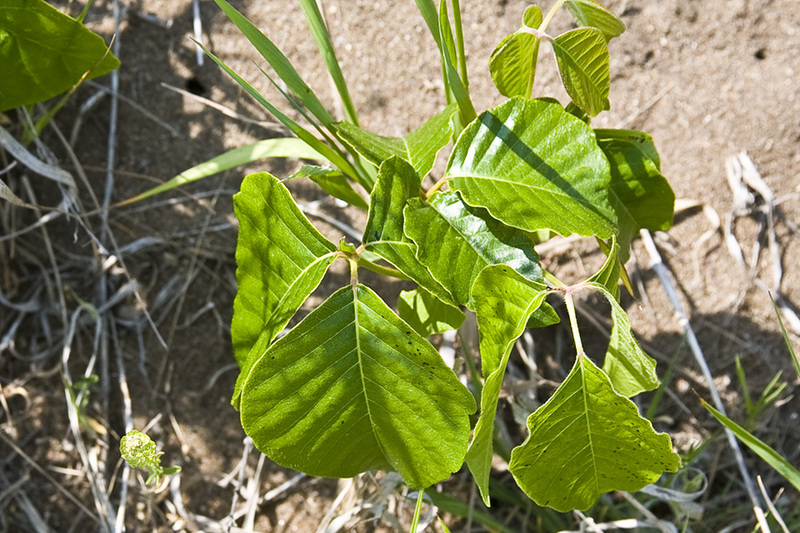 Throughout the year young leaves are shiny becoming dull with maturity. In the fall the leaves turn yellow to orange, rarely bronze to red. Black spots may appear on any part of the plant. The spots are urushiol, the resin that causes allergic reactions. When the plant is damaged urushiol is exuded in an attempt to seal off the damaged area. The resin is creamy, turning brown-red then black with oxidation. 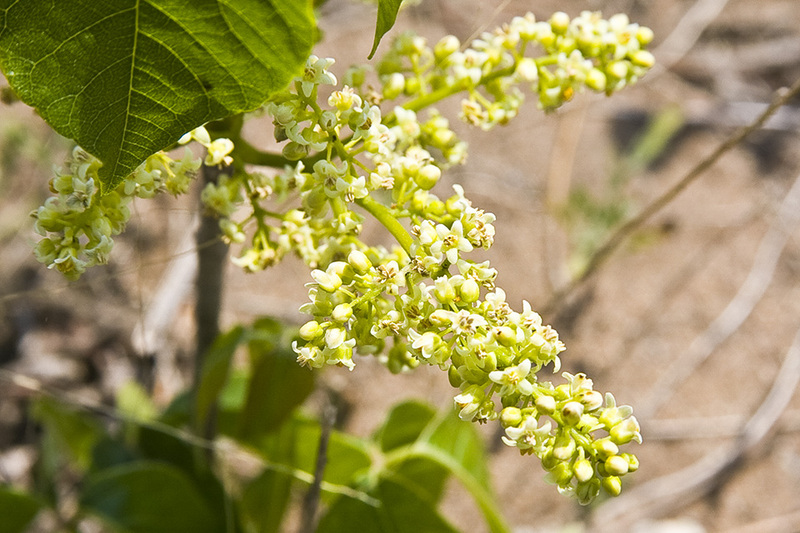 The inflorescence is an elongated, 4″ to 16″ long, unbranched or sparingly branched cluster with usually fewer than 25 flowers. The flower has 5 yellowish petals. The fruit is a hairless green berry that turns ivory at maturity. 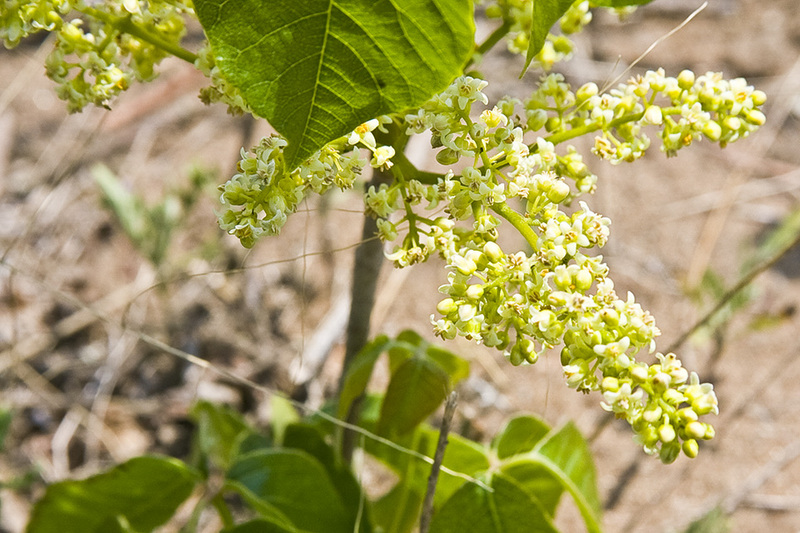 The fruit cluster is compact and erect. 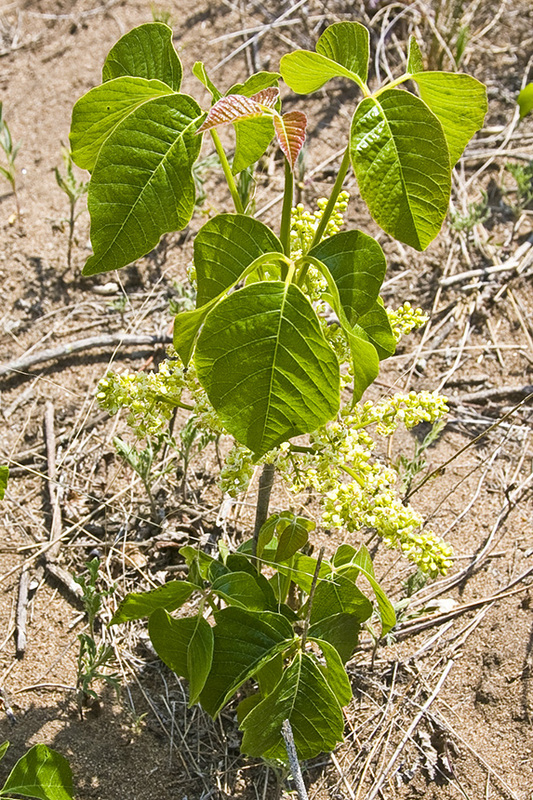 Boxelder (Acer negundo) saplings may have 3 (usually), 5 (occasionally), or 7 (rarely) leaflets. 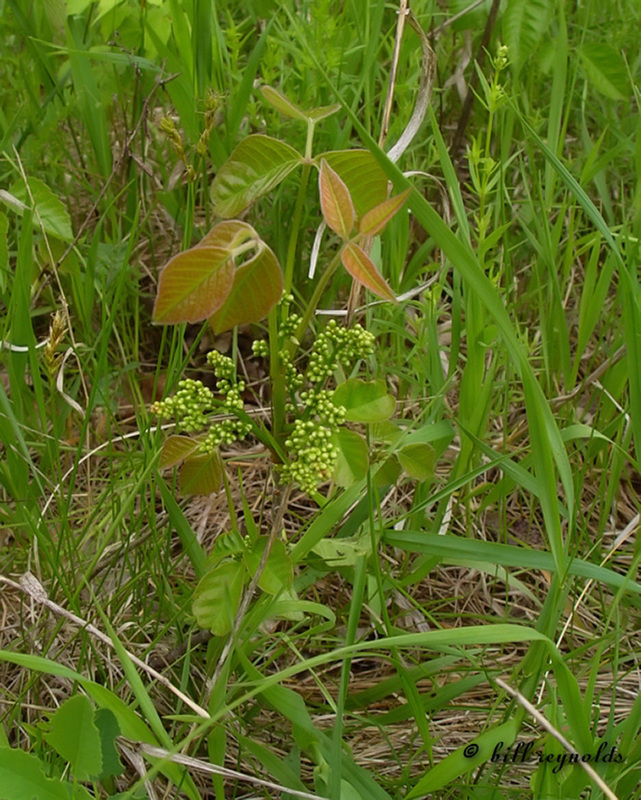 When it has 3 leaflets it can be indistinguishable from western poison ivy. 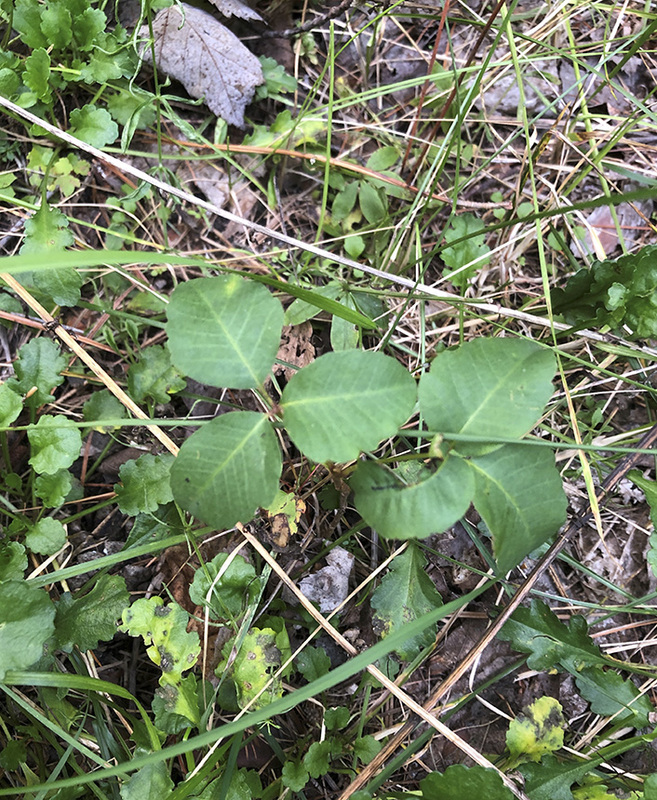 Eastern poison ivy (Toxicodendron radicans ssp. 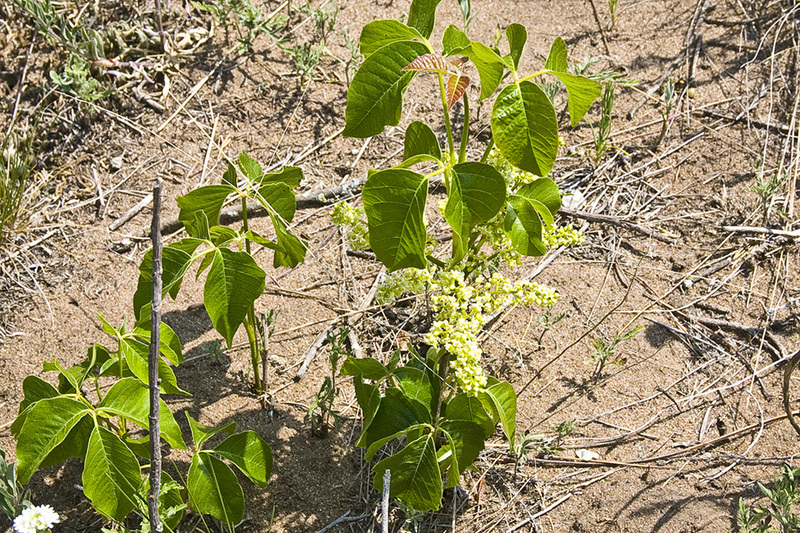 negundo) is a vine, not a shrub. It climbs trees. The stems have aerial roots. 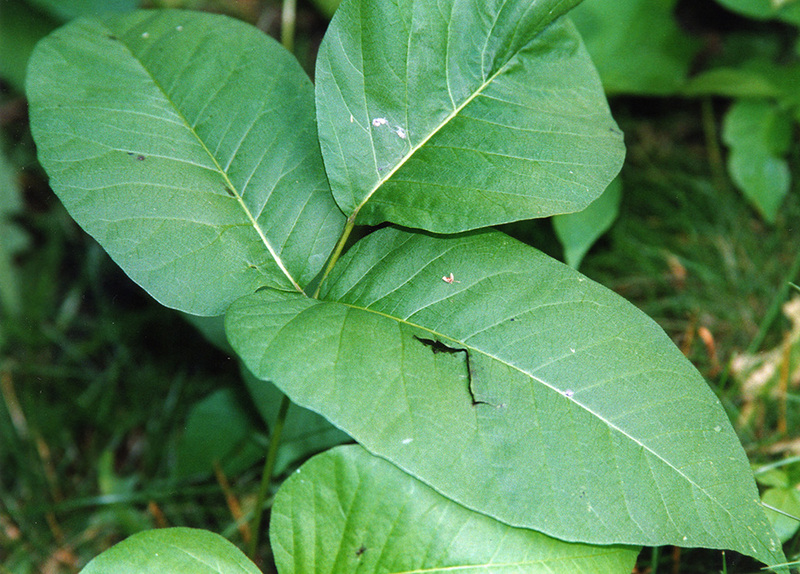 The leaf stalks are densely hairy. The leaflets tend to be flat, not folded along the midrib. The inflorescence is 3″ to 4″ long. The fruit cluster hangs downward. 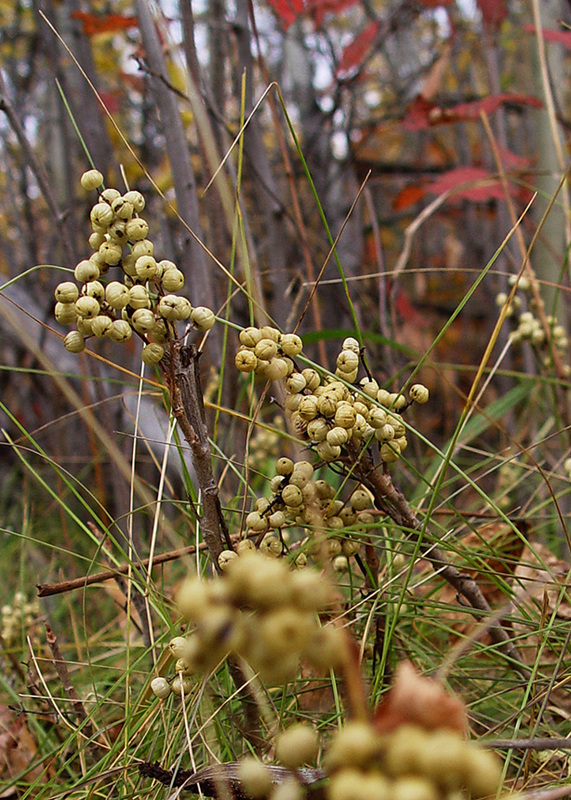 The sap of this plant contains the allergenic urushiol. Urushiol is not a single chemical but a complex of five chemicals called alkylcatechols. Several exposures to the substance may be necessary to impart sensitivity. Research has shown that 85% of all people will develop contact dermatitis after adequate exposure. It usually takes 12 to 48 hours for a rash to develop on a previously sensitized person. In some individuals, a single exposure will cause a reaction. In these individuals, the rash will develop in seven to ten days. The lesions last 14 to 20 days. Rashes do not spread and are not contagious. Treatment can dry the blisters, reduce swelling, and relieve itching, but will not speed healing. 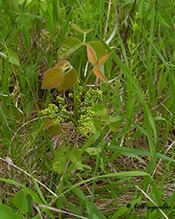 Contact with the outer surface on an undamaged plant should not cause an allergic reaction unless there is residual urushiol present from a previous injury to the plant or a nearby plant. Contact with a torn leaf, broken or damaged stem or rhizome, or black spot will cause a reaction in those sensitized to urushiol. Continuous; not toothed, notched, or lobed. 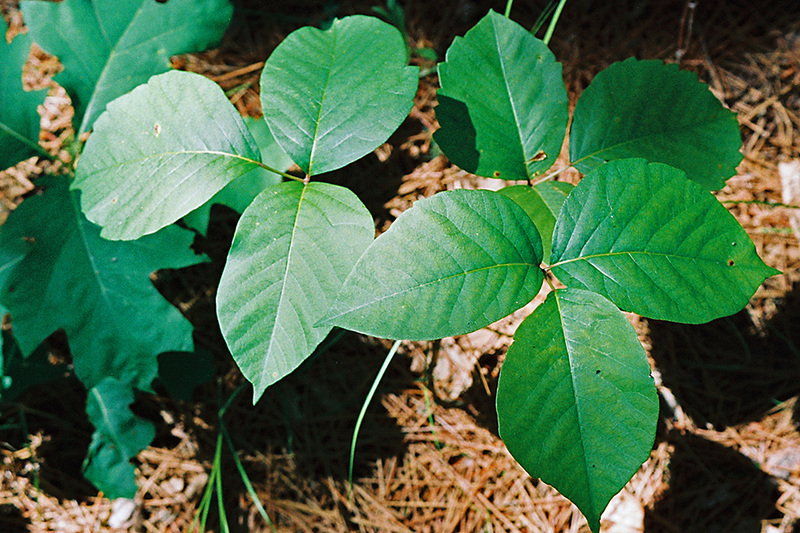 Collectively, the five chemicals (alkylcatechols) in the sap of Toxicodendrons that cause allergic reactions in humans. 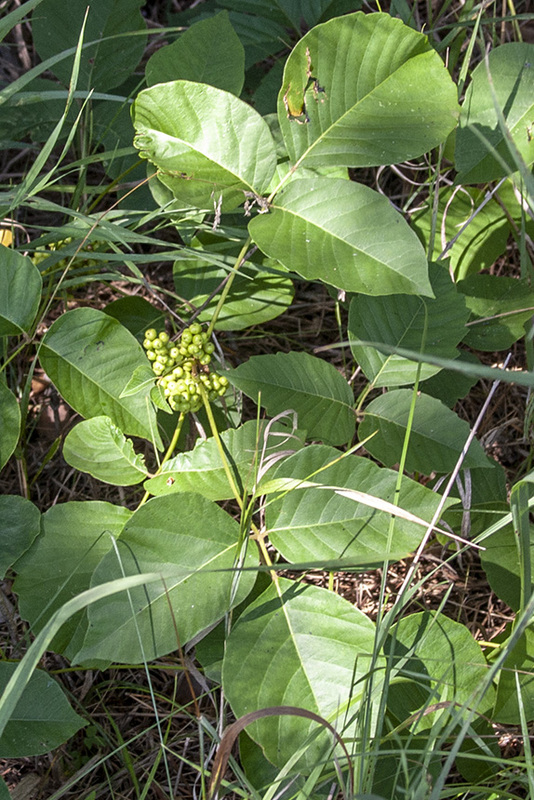 Shrubs, subshrubs, and rarely vines that produce yellowish white drupes. Montana harbors only one species that is common along riparian corridors and on protected slopes with a south aspect. Blue big leaf asters (Eurybia macophylla?) and red western poison ivy (Toxicodendron rydbergii) make their seasonal contributions to our autumnal colors. Photographed at the Turtle River State Park, North Dakota (15 September 2012).